Euan's Guide | You're great! You did it! Thank you! You're great! You did it! Thank you! The title really says it all - but we wanted to say a massive thank you to everyone who voted for us in the recent BT infinity Lab Connected Society competition. You helped us win the People's Choice award... And you helped us win it in style... In fact, according to the judges, you helped us "win by a landslide"...! 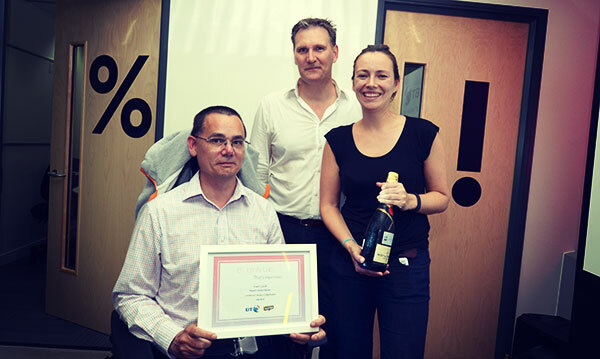 Pictured are Paul & Antonia who picked up the award on behalf of the team and BT's Will Pryke. The awards were "for innovations that use ICT and communication technologies to address current and emerging social challenges” and we're looking forward to working together to make Euan's Guide even better. PS a special thank you to the lovely person who sent us the yummy Winner's biscuits this morning too!